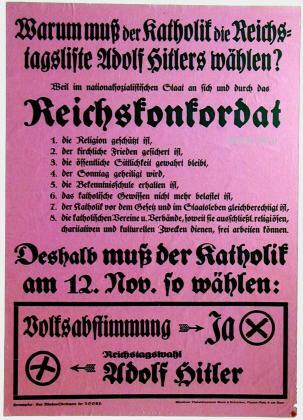 Hitler's 1933 election posters boast of his alliance with the Catholic Church. This refutes the claims of Benedict XVI on his 2010 trip to Britain, that atheism helped the Nazis to power. Actually, it was his own church that filled that role. It appears that already in 1933 Hitler and the pope were conspiring to send the Germans off to war to fight their common enemy, Communism. 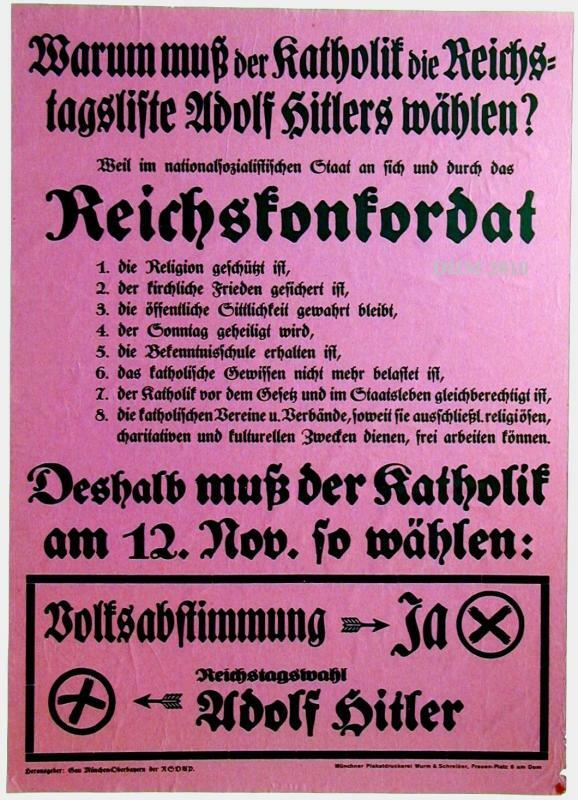 The two posters were printed for the Reichstag election of 12 November 1933, when voters were already being presented with a single list of candidates to be approved or rejected as a group: the “Hitler list”. And it worked. The German voters had no idea that their Führer and their Pope were conspiring to send them off to war. In the November 1933 election 93% of the unspoiled ballots approved the Nazi decision to withdraw from the League of Nations and 92% endorsed the “Hitler list”. This election doomed the Reichstag to political insignificance. Naturally, the second poster doesn’t mention that the concordat (Reichskonkordat) also contained a Secret Supplement providing for a future German mobilisation, in defiance of the Treaty of Versailles. In fact a 1931 draft of the Austrian concordat which also contains a Secret Supplement suggests that already in 1931 the Pope expected Germany to go to war against Russia. And a recently discovered letter shows that twelve years later, when this indeed happened, Pius hoped for a German victory. 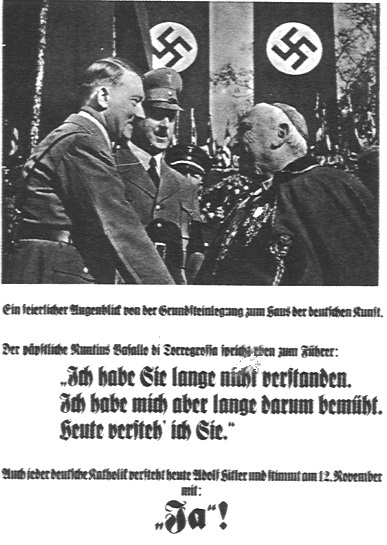 Contrary to Benedict XVI's claims that the "Nazi tyranny [...] wished to eradicate God from society", Hitler was quite happy to use the Catholic Church to control the faithful. He embraced the classic strategy of colonialism: use the people's "natural rulers" to keep them obedient to the new regime. It was a marriage of convenience: Pius got a favourable concordat and a German army to fight Communism, while Hitler got the “Catholic vote” to help bring him to power. A solemn moment at the laying of the corner stone of the House of German Art. “For a long time I didn't understand you. But I have long tried to do so. Ein feierlicher Augenblick von der Grundsteinlegung zum Haus der deutschen Kunst. „Ich habe Sie lange nicht verstanden. Ich habe mich aber lange darum bemüht. 8. die katholische Vereine u. Verbände, soweit sie ausschließl. religiösen, charativen und kulturellen Zwecken dienen, frei arbeiten können. A good summary of the steps by which Hitler consolidated his power has been posted by the German Government: “National Socialism (1933 - 1945)”.